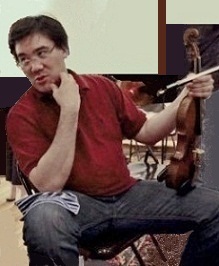 Alan Gilbert is an American violinist, conductor, and teacher, born (in New York) on February 23, 1967. Although trained as a violinist from an early age, he pursued a conducting career while still very young – Daniel Barenboim did essentially the same thing. His conducting pursuits took such a serious turn that the highest post he attained as a violinist was assistant concertmaster of the Santa Fe Opera Company (New Mexico) in 1993. He was 26 years old. Gilbert is much better known as the recently appointed conductor of the New York Philharmonic. He joins Peter Oundjian, Neville Marriner, Jaap Van Zweden, Jean-Pascal Tortelier, David Zinman, Lorin Maazel, Eugene Ormandy, Pierre Monteux, Jacques Singer, Charles Munch, and Theodore Thomas, in a group of violinists who essentially almost entirely left the violin for the podium. There is another group of contemporary violinists who also conduct but who continue to concertize assiduously – Jaime Laredo, Pinchas Zukerman, Itzhak Perlman, Salvatore Accardo, Joseph Silverstein, Joshua Bell, and Leonidas Kavakos are in this group. Do violinists or pianists make better conductors? I would not know. According to at least one source, Gilbert made his violin debut with the New York Philharmonic in October of 2011. The piece he chose was Bach’s two-violin concerto. The same piece was chosen by Alma Rose' for her debut in 1926. Gilbert has an affinity for modern music, music which is, for the most part, unintelligible, as far as I’m concerned. Though Gilbert has already programmed a number of world premieres, it is doubtful that he will ever match Theodore Thomas’ record of 112 world premieres with the Chicago Symphony. In any case, Gilbert’s premieres would be music which almost nobody wants to listen to a second time. Thomas, by the way, conducted the New York Philharmonic for four years way back in 1887. Gilbert began his violin studies as a child. It was not difficult since his mother, his father, and his grandfather were (are) all professional violinists. He later enrolled at Harvard University, the New England Conservatory of Music, the Curtis Institute, and Juilliard. Beginning in 1994, Gilbert won a number of conducting prizes which helped further his conducting career. Gilbert was assistant conductor with the Cleveland Orchestra from 1995 to 1997. In January of 2000, he became conductor of the Royal Stockholm Philharmonic Orchestra, a post he held until 2008. From 2003 to 2006, he served as Music Director of the Santa Fe Opera. He has also been Principal Guest Conductor of the NDR Symphony (Hamburg, Germany) since 2004. In September of 2009, he began his tenure as Chief Conductor of the New York Philharmonic, although his appointment came in July of 2007. He was 42 years old. In September of 2011, he was appointed Director of Conducting and Orchestral studies at Juilliard. As for his violin, I guess it is safely put away, though not forgotten. I happened to hear the performance of the Bach double violin concerto and was impressed with Gilbert’s style as well as his technical accomplishments as a violin player. Gilbert’s website features him as a conductor and chamber musician and there are several videos of performances on YouTube – one such is here with the Sibelius concerto. Alma Rose was an Austrian violinist who was Gustav Mahler's niece. She died in a concentration camp just before the end of World War II. Thank you so much for your comment! I enjoy finding new violinists and writing about them.